Learn and talk about everything happening in the sports world of Europe. 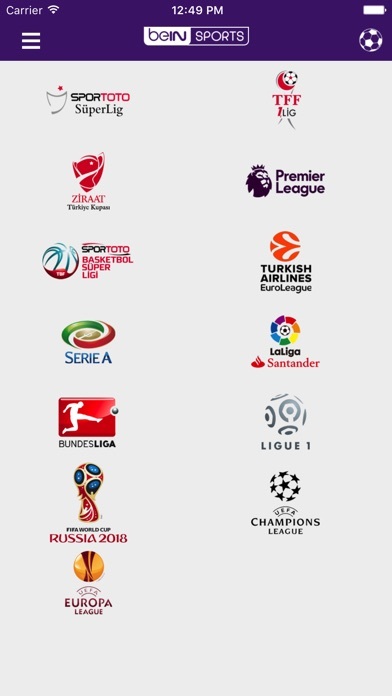 All major football (Premier League, La Liga, Bundesliga, Italian Serie A, Ligue 1, Turkish Super League, FIFA World Cup, UEFA Champions League, UEFA Europa League) and basketball (Turkish Airlines Euroleague, Turkish Basketball League) organizations are covered in the app. How the teams and players have been performing till now and what’s coming next in the competition. Who are still in the challenge for the title or in the race a place in next year’s UEFA organizations. Which teams are feeling the heat of relegation. Who have scored or assisted the most. Watch all hightlights from all the matches of English Premier League, La Liga, Italian Serie A, Ligue 1, Turkish Airlines Euroleague and Turkish Basketball League. For Turkish SporToto Super League matches, you can also subscribe to CepteGol and watch goals, important moments and pre/post-game interviews live as they happen. Can't watch the game? Don’t miss the action by subscribing to a team’s whole fixture or a specific match to get live score updates as push notifications. Bored of reading? Have a look at the photo gallery of the match last night, read the highlights from newspapers or get the latest rumours from the transfer market. Browse the video galleries to watch the most liked moments of the week, previous match highlights of the derby next week or your favorite players best goals. Not being able to watch the game does not put you out of the enthusiasm. Get informed about everything happening live in the match center. Get live commentary, vote for the man of the match, read all the news about the action or watch the videos of important moments.